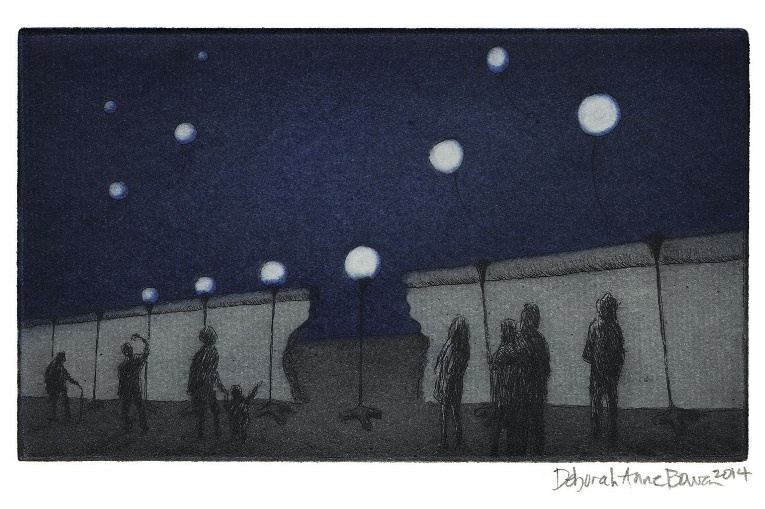 My 2014 holiday etching celebrates the fall of the Berlin Wall 25 years ago and the beautiful Lichtgrenze, an impressive and (for me) very moving installation of balloons along the former course of the wall through the middle of Berlin. The balloons were released one after the other on the evening of November 9. Three-color Japanese woodblock print on Kozushi paper. Printed over two weekends at Druckatelier in Berlin-Neukölln. Dedicated to the local foxes and to the beautiful Tempelhofer Feld. May it remain wide-open and free for all the people and foxes (and other animals) of Berlin! 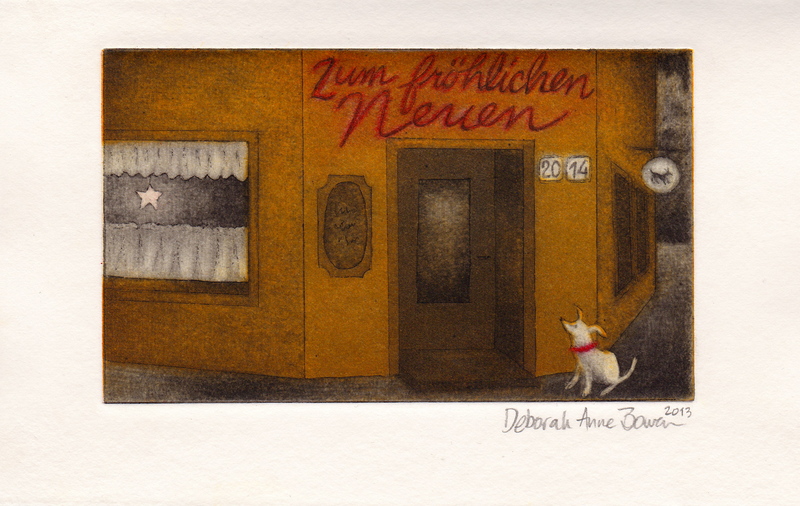 This continues my Berlin-themed holiday card series: Eckkneipe with waiting dog – both, to me, are Berlin. Since working on this card, I have become obsessed with old Berlin signage, especially neon script. More of that to come (at some point)! These two foxes were the subject of my Japanese woodblock print / new year’s card last year. They’re all about play. They’re friends and maybe they’re in love (no one is sure). I love Berlin’s foxes and how they have an independent life alongside the human residents of this city. I think they probably play a lot at night when people aren’t looking. This year’s etching was inspired by my heroes of the Berlin streets, bike messengers. This ecologically mobile Santa is speeding past the Brandenburg Gate, heading south with a bag full of happiness for the new year. This is a three-plate etching with parts in drypoint and mezzotinto. My most recent card, with Berlin landmarks on the skyline. Two-plate etching. 12.5 x 7.5. A Trabi (Trabant, the old East German car) with Berlin license plates and a very big Christmas tree. 12.5 x 7.5 cm.